How to save test result to file? I want to keep them so that I can compare them with later runs. 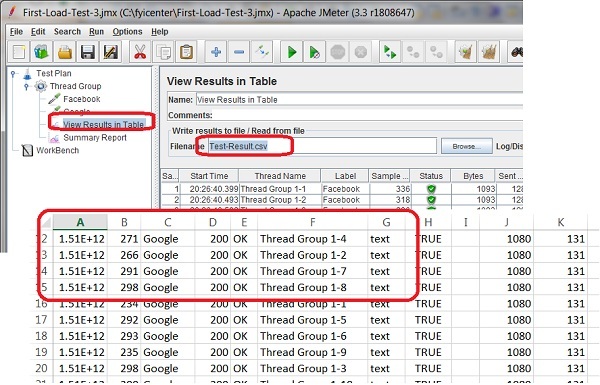 You can follow this tutorial to save test result of your first JMeter load test. 2. Click to open "View Results in Table" screen, and enter "Test-Result.csv" in the "Filename" field. 3. Save the test plan and run it again. 4. Open the "Test-Result.csv" in Excel. You see the test result is nicely saved in columns and headers. 5. You can also open "Test-Result.csv" in a text editor to view it.